Kiki & Coco In Paris is love at first read! It is unlike any book I’ve ever seen or read. The book takes it’s readers on a fascinating photographic adventure to Paris through the eyes (and photo lens) of Kiki’s mother, Stephanie Rausser. Jess Brown is a California based doll designer and owner of the very popular boutique, Maude. She began making rag dolls for her children Stella and Tiger just a little over a decade ago. The dolls are created using cotton muslin, linen, bamboo lace weight Japanese yarn, refashioned Cashmere sweaters and antique remnants. Each doll is uniquely hand dyed using Persian Black Tea to create a variety of skin tones. Italian fashion designer Bottega Veneta commissioned Jess to create life size dolls of her collection to be featured in their New York City, Los Angeles, Paris, London and Milan stores during Fashion Week last month. And you can be one of the first people in the Washington DC area to get a Jess Brown doll and Kiki & Coco In Paris book. I have a feeling that Oprah is going to discover these dolls and feature it in her magazine as a Holiday favorite one day soon. And this is already my favorite children’s book. 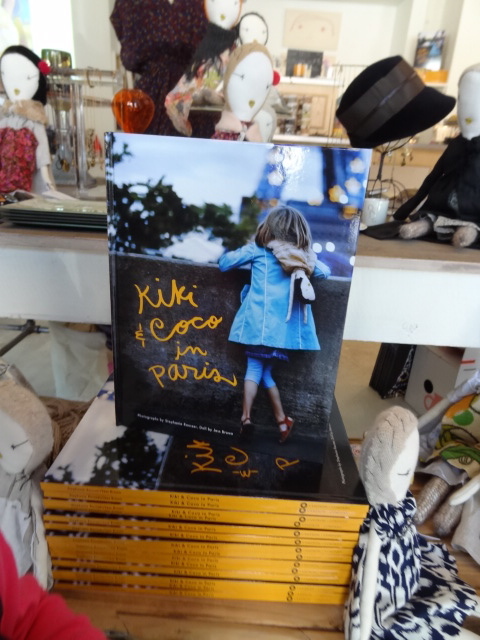 I’m lucky to have an autographed copy of Kiki & Coco In Paris. Become one of the lucky collectors of these dolls and get your book in time for the holidays while they’re available here at M29.